Deshilachado: Tiempo de patchwork y de punto: Hatched and Patched y Fuzzy Mitten. Tiempo de patchwork y de punto: Hatched and Patched y Fuzzy Mitten. Ya asoma el frío en Valencia. Es tiempo de patchwork y de punto. Mi cabeza va mucho más deprisa que mis manos, como siempre, y estoy pensando en muchas ideas que quiero realizar. Pero casi mejor os hablo de cosas reales. Esta vez me voy a ir muy lejos geográficamente, a Australia y a Canadá, aunque Internet lo acerca todo, así que no importa. The cold is already arriving in Valencia. It is time for patchwork and knit. My head is much faster than my hands, as usual, and I am thinking about many different projects I’d like to make. But I think it is better to tell you about things. This time I am going very far geographically, Australia and Canada. But Internet gets everything much closer, so it does not matter the distance. En Australia vive una artista del patchwork llamada Anni Downs, que hace unas creaciones de ensueño. Tiene una empresa, Hatched and Patched, que creó en 1996 y que ha ido creciendo hasta extenderse por todo el mundo. Hace quilts, cuadros, bolsos, muñecas y muchos otros objetos de decoración, además de escribir libros donde recoge los patrones de sus diseños. En su página web podéis ver su historia, comprar sus productos, etc. También tiene un blog muy interesante donde explica su proceso creativo. Me gusta especialmente la combinación de bordado y patchwork de sus obras, perfectamente coordinados. Y el uso de los estampados y los colores de las telas, muy equilibrado y con un aire romántico. Ha desarrollado un estilo propio realmente precioso y reconocible entre las amantes del patchwork. 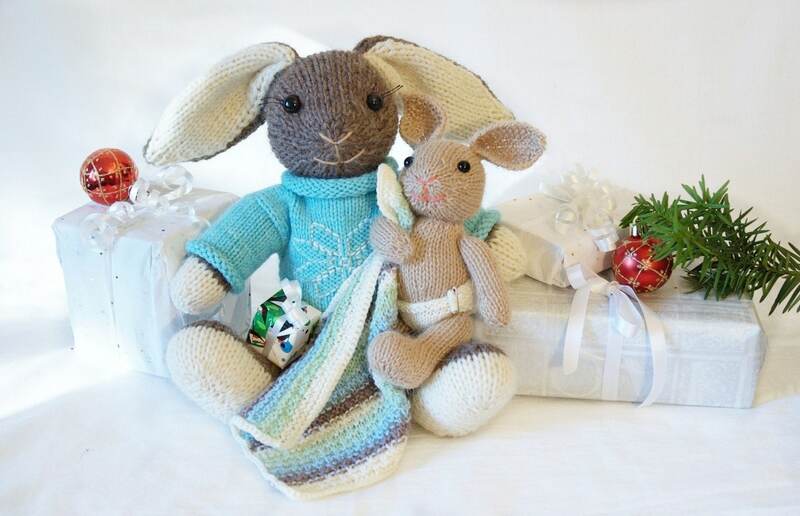 In Australia lives a patchwork artist called Anni Downs, who makes some lovely creations. She has a company, Hatched and Patched, created in 1996, which has grown and spread throughout the world. 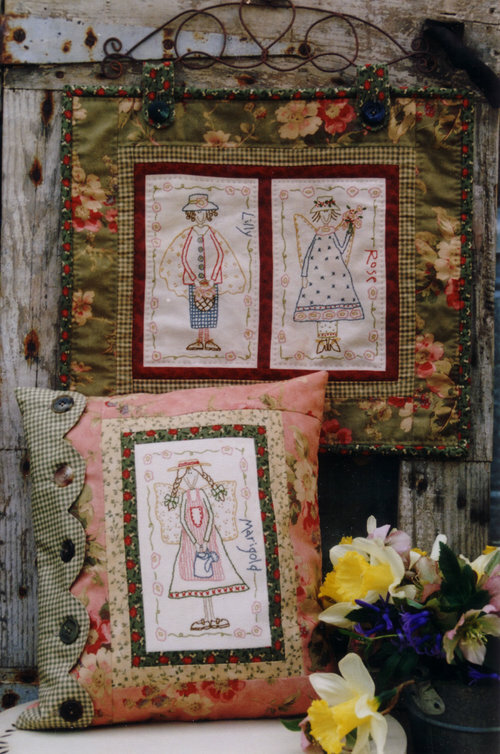 She makes quilts, wall hangings, bags, dolls and many other decorative objects, in addition to write books where she shows the patterns of her designs. In its web page you can see her history, buy her products, etc. 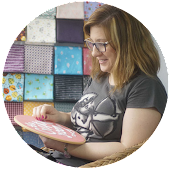 It also has a very interesting blog where she explains her creative process. I especially like the combination of embroidery and patchwork on her works, both perfectly coordinated. And the use of materials patterneds and colors, very balanced and with a romantic air. She has developed an style of her own, really nice and recognizable among patchwork lovers. 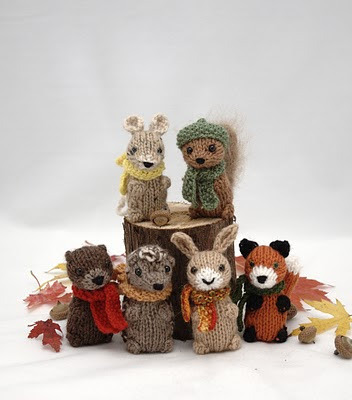 En Canadá reside otra estupenda artista, Barbara Prime, diseñadora y copropietaria de Fuzzy Mitten junto a su marido. Diseña muñecos de punto cuyos patrones vende en Etsy. Yo he comprado varios. Como os he comentado alguna vez, es muy cómodo y rápido porque me los envían por e-mail en PDF. Sus muñecos son dulces y tiernos. Aparentemente sencillos, tienen muchos detalles en realidad. Hay muchos patrones de ropita, así que puedes ir cambíandosela al animalito que hagas. Es un regalo ideal para hijos, sobrinos, etc. Los niños valoran que les regales algo hecho por ti. Mi hija es mi mayor reclamo. Sus amigas, con una falta total de espíritu crítico, todo hay que decirlo, creen que soy una supermamá por las cosas que le hago. Os aconsejo también el blog de Fuzzy Mitten. Explica como va haciendo los muñecos e incluso publica algún patrón de otras cosas (un gorro para niño, por ejemplo). In Canada lives another great artist, Barbara Prime, designer and co-owner of Fuzzy Mitten with her husband. 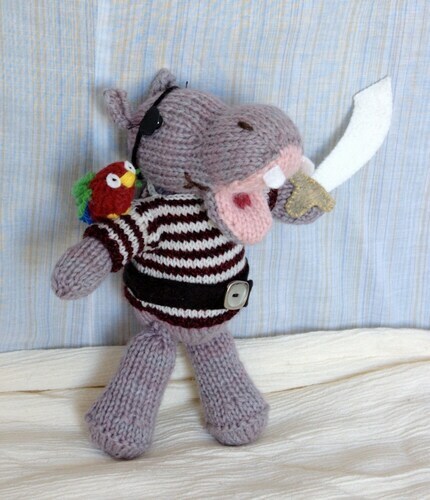 She designs knit puppets whose patterns sells on Etsy. I have bought several. As I have already mentioned, it is very convenient and faster because they send it by e-mail in PDF format. Their puppets are sweet and tender. They are apparently simple, but in reality have many details. There are many patterns for making clothes for them, so you can change the pet you make. It is an ideal as a gift for your children, nieces, etc. Children value to receive gifts made by the person who gives it. My daughter is my greatest lure. Her friends, with a total lack of critical spirit, it must be said, believe that I am a “Supermom” because of the things I make for her. I also advise you to visit the Fuzzy Mitten blog. It explains the puppets creation process and even includes some patterns of different things (a cap for child, for example). ¿A qué dan ganas de coger las agujas para poder achucharlos cuanto antes? 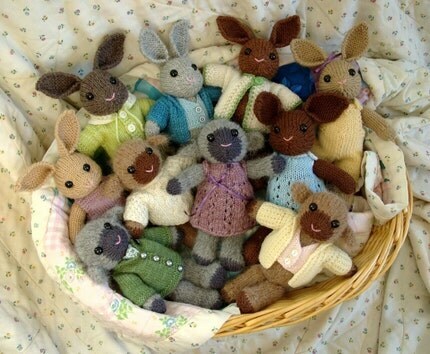 Don’t you feel like taking the needles for making one of them and hug it as soon as possible? Preciosos, la verdad, sí que dan ganas de ponerse manos a la obra! Porque será que el ritmo de nuestra cabeza es infinitamente superior al de nuestras manos. Necesitaríamos días de muchas mas horas y tampoco llegaríamos a poder hacer todo. Por aquí hace ya mucho frio y apetece empezar a hacer labores. Gracias, Josefina. Me alegro que te gusten. Tus trabajos también me encantan, sobre todo el juego de sábanas de Eli.